Four years after Ferran Adria’s El Bulli closed its doors, the prize, awarded by the British magazine Restaurant, has returned to Catalunya. I haven’t yet eaten at the Celler de Can Roca, but it seems to be in a similar vein to El Bulli and, in the UK, to Heston Blumenthal’s Fat Duck. Whether you’re cooking up something mysterious and magical using flasks and potions like the Rocas or whether you’re knocking out lunch for the family, you can’t go far wrong when you have the raw ingredients available in this part of Spain. Traditional Catalan cuisine is quite different to the cooking of other regions. A lot of it centres on four sauces: allioli, sofregit, picada and samfaina. Allioli is like aioli, or garlic mayonnaise, without the eggs; sofregit is really a sauce base, made by cooking tomatoes and onions down to a melting mass; picada is a paste made, usually but not exclusively, with garlic, almonds, fried bread and olive oil and used as a thickening and flavouring agent; and samfaina is generally a mixture of onion, aubergine, peppers, tomatoes, garlic and courgettes, similar to ratatouille but in my view far nicer. 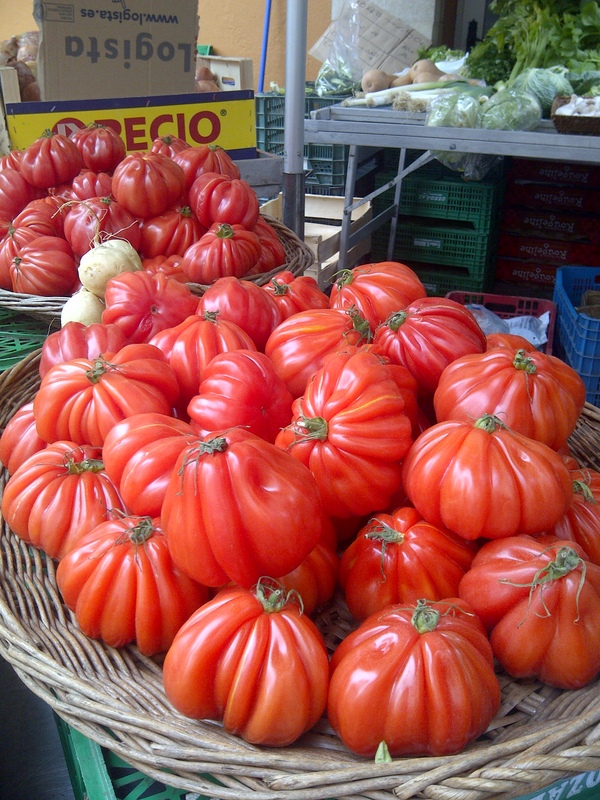 Then there’s the famous romesco sauce, based on pounded almonds and hazelnuts, dried peppers and tomatoes. 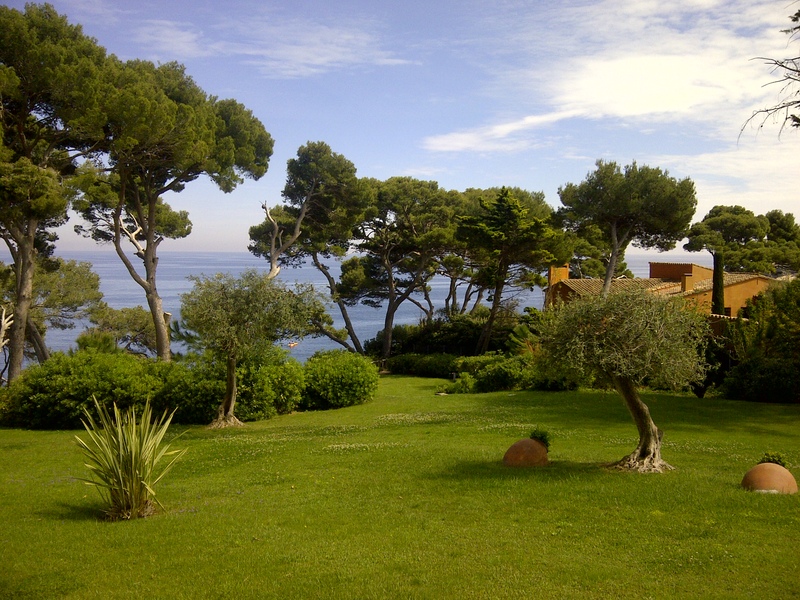 It’s often served with fish and invariably with the Catalan dish of calçots, a type of giant spring onion. It’s worth trying to get to Catalunya for the special calçot festivals, the calçotadas, when the onions are first barbecued and then steamed before being served up with vats of romesco – and bibs. It’s a deliciously messy process. The festivals usually run from January to March. We’re lucky enough to have a share in a family flat bought by my late in-laws back in the 1960s, in the days when the UK government restricted the amount of cash you could take out of the country to a measly £50. Now we fly with Ryanair and have to restrict our carry-on luggage quota instead. We rent out our apartment when the family’s not there (sorry, all booked up this year into September) and one of the things guests most often remark on is the well-equipped kitchen. There’s a good reason for that. We love to cook. Well, you knew that already. 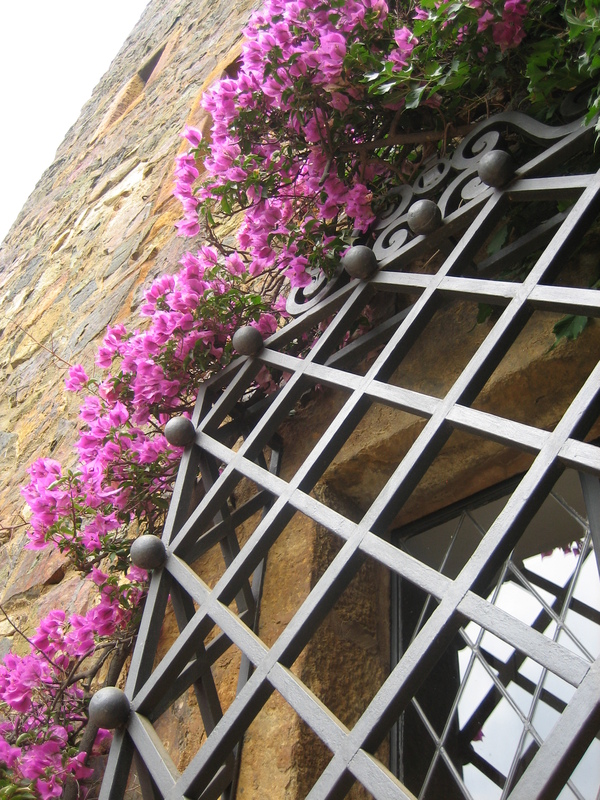 There’s a daily (except Mondays) market in the nearby town of Palafrugell, which I think translates as Palace of Flowers. 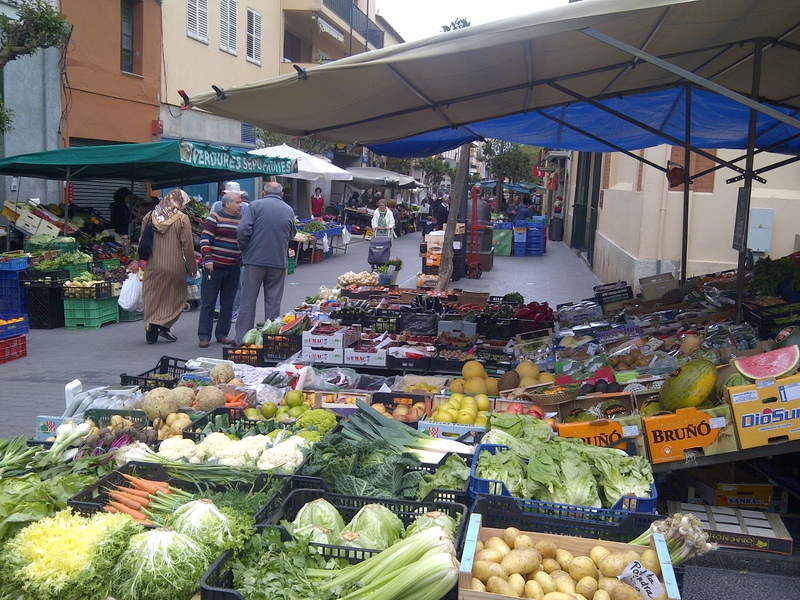 It’s a rather romantic name for such a sturdy working town but the market produce is certainly fit for a king’s table. 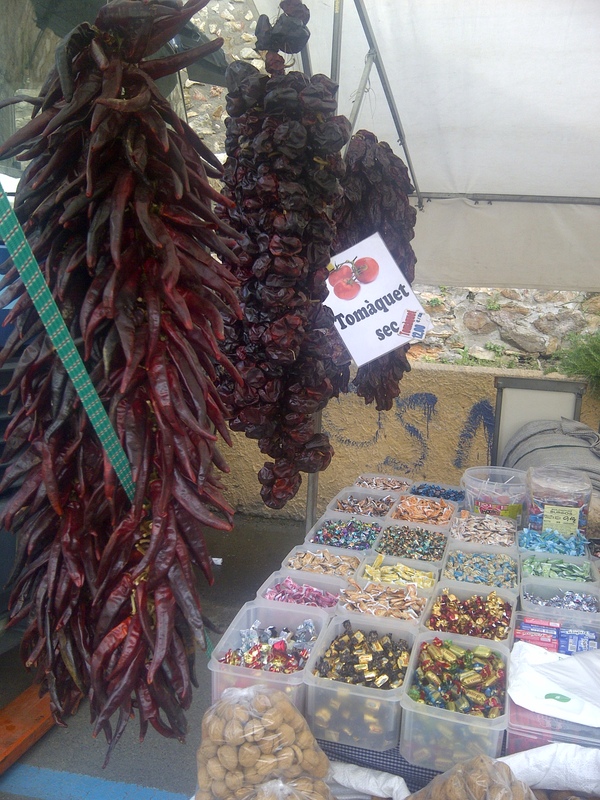 There are the outdoor fruit and veg stalls which straggle down to the cafe-lined main square, some of them commercial operations, but sometimes still run by unblinking old ladies selling the produce picked fresh from their own kitchen gardens. Tomatoes of every shape and size, including the lumpy salad tomatoes we call Big Uglies (a sort of Marmande, I think), aubergines, peppers, lettuce, French beans, asparagus, broad beans and peas freshly shelled or in the pod and wild mushrooms in season, cucumbers, onions, melons, oranges and lemons – you get the idea. There’s an fabulous indoor fish market selling gleaming silvery piles of Mediterranean seafood; and there’s another next door which sells meat and poultry, eggs and cheeses and the excellent cured hams and sausages Spain is so famous for. 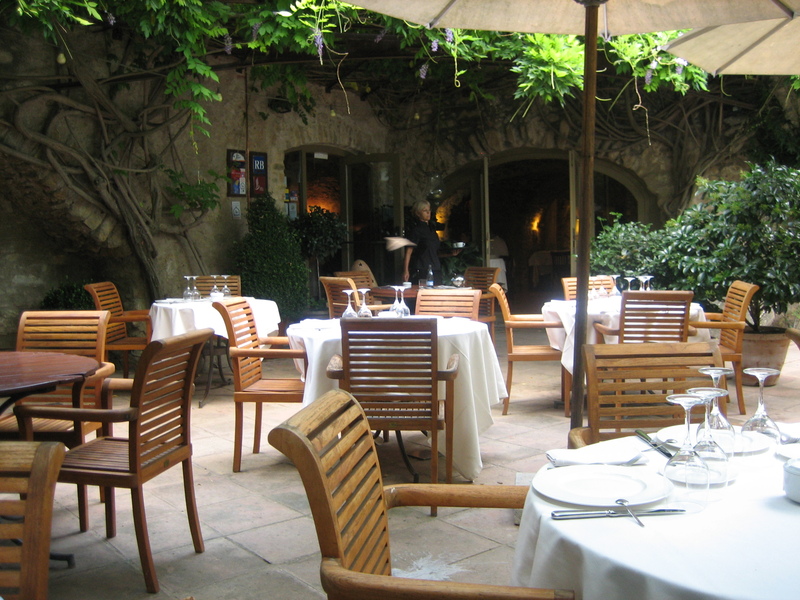 If you can’t be bothered to cook, there are some terrific restaurants, most of them a bit more accessible to mortals than El Celler de Can Roca. Our current favourites if we’re spoiling ourselves are La Placa de Madremanya, in a hilltop village near the ceramics town of La Bisbal (delicious food, lovely staff and a pretty wisteria-covered terrace) and Toc al Mar, on the beach at Aigua Blava (amazing seafood, equally nice staff and a view of the bay). Sorry, I was so overcome by greed at my giant dish of mussels followed by griddled octopus with romesco sauce from Toc al Mar, that I only remembered to take a picture after the event. Neither of these restaurants is cheap – two courses for two people with a bottle of local wine and coffees at Toc al Mar was around 90 euros, including a tip. But you can eat well for a lot less. Killing time at Girona airport after mucking up the flight bookings, we went to El Mirador, tucked away along a potholed road behind the terminal. Two generous courses apiece, three or four beers and a coffee came to the grand total of 20 euros. And the food was good – gazpacho, tuna and bean salad, calves’ liver cooked with garlic and parsley and two juicy pork kebabs. Cheapest of all, of course, is to cook for yourself. We were there on a working break, painting, varnishing and cleaning the apartment, so we didn’t have much energy left at the end of the day to cook anything elaborate. 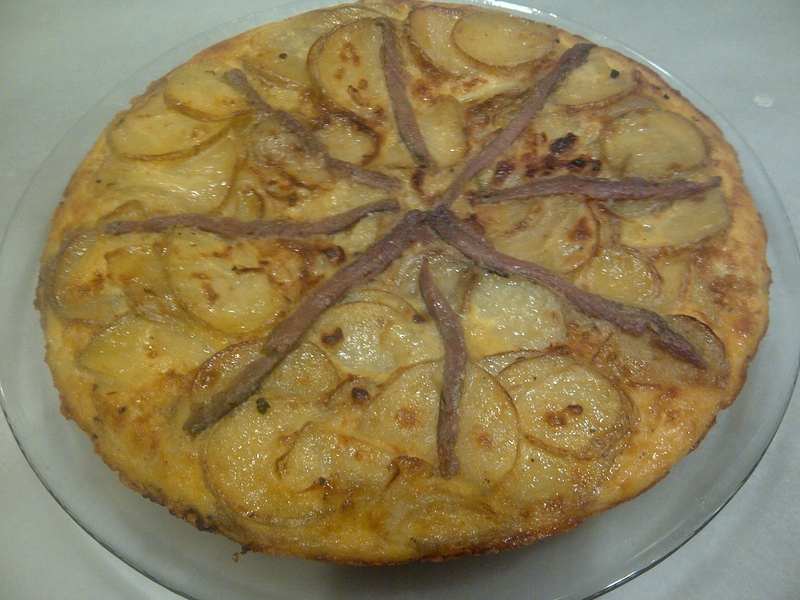 We made a longtime favourite, a classic Spanish omelette, or tortilla. My sister in law Sarah was taught how to make this when she was an au pair in Valencia donkeys’ years ago, looking after a horde of posh Spanish kids who had to be changed into different outfits about ten times a day. And she taught me. 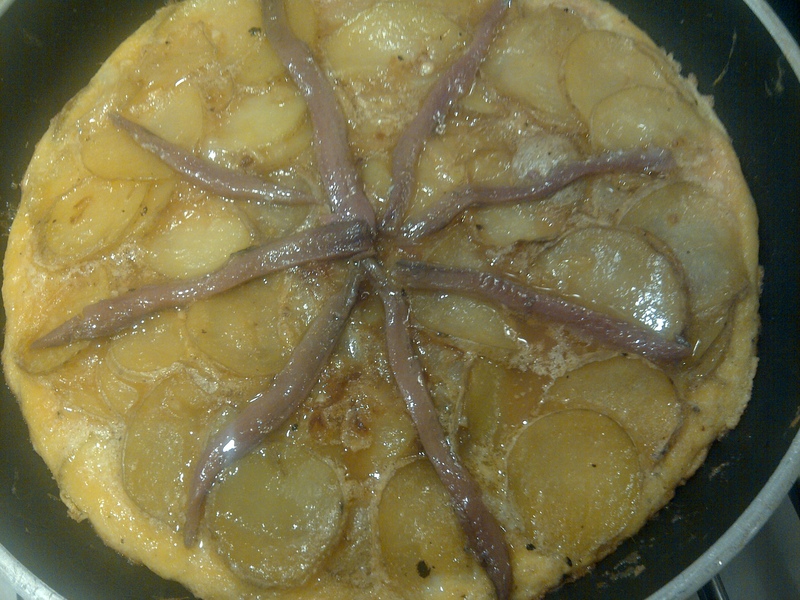 I depart from her recipe by adding onion to the potato omelette, but it’s an accepted variation on the theme. This is one of those dishes which is ridiculously easy but quite time-consuming. Plan on setting aside an hour or two. You can potter about doing other things but don’t go too far from your stove . It’s all about slow, gentle cooking. 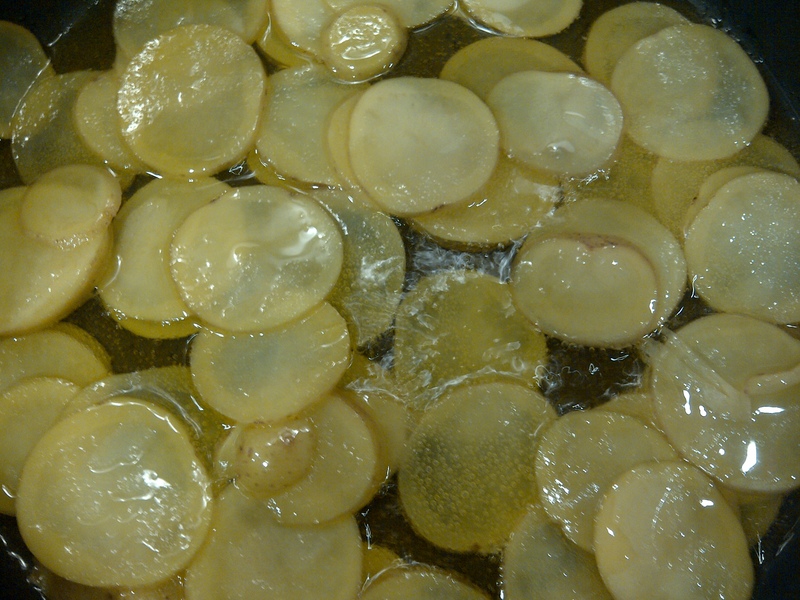 About 2.2lb (1 k) of waxy potatoes, scrubbed and thinly sliced across into rings or half moons. You can peel them or not, your choice. 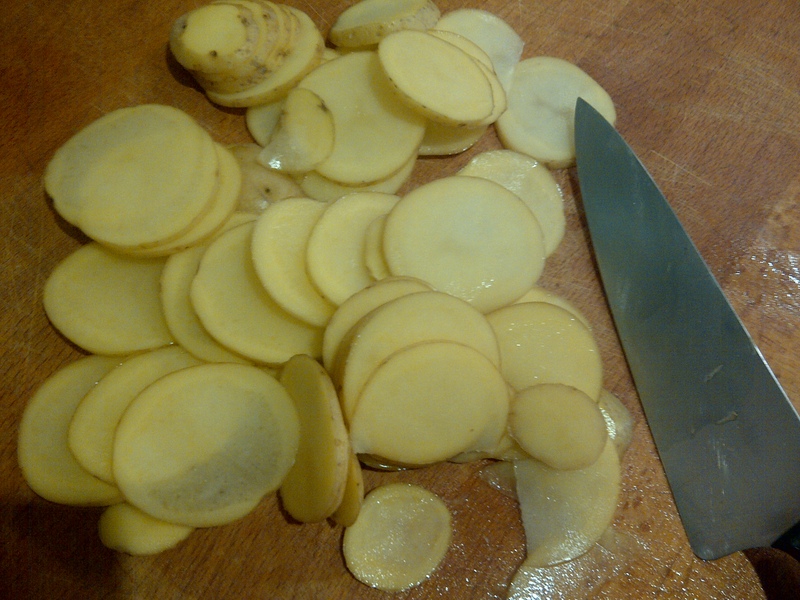 Slice your potatoes about 1/8th of an inch or 5mm across. Pour oil into your biggest, deepest frying pan to a depth of about 1″/2.5cm. Heat to a medium temperature then lower it right down and put in your first batch of potato slices, making sure they’re completely covered by the oil. 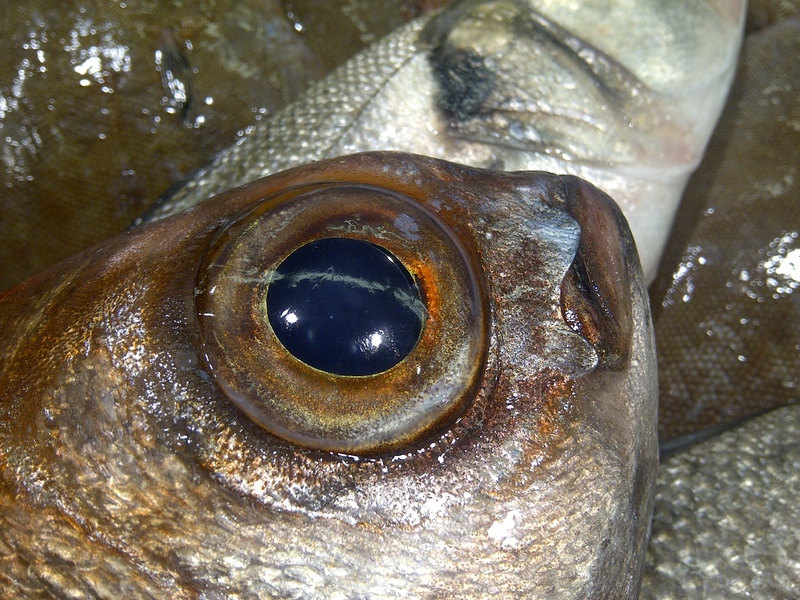 Cook until tender but uncoloured – you are aiming almost to poach the potatoes in the oil rather than frying them. They shouldn’t brown. When tender, remove to a large plate lined with kitchen paper to drain. Put in the next batch and continue until all of the potato slices are tender. Then fry the onion, sliced into thin half moons, until cooked through but again, don’t frazzle it. Add the garlic for the last minute or two. Remove and drain well. You can strain the oil and re-use it on another occasion. Beat the eggs in a large bowl. Season well with salt and freshly ground pepper. When the potatoes and onions have cooled somewhat, add them to the beaten eggs. Take a deep omelette pan about 9″-10″ across (23-25 cm) and heat about a tablespoon of oil in the bottom, enough to coat the pan base. 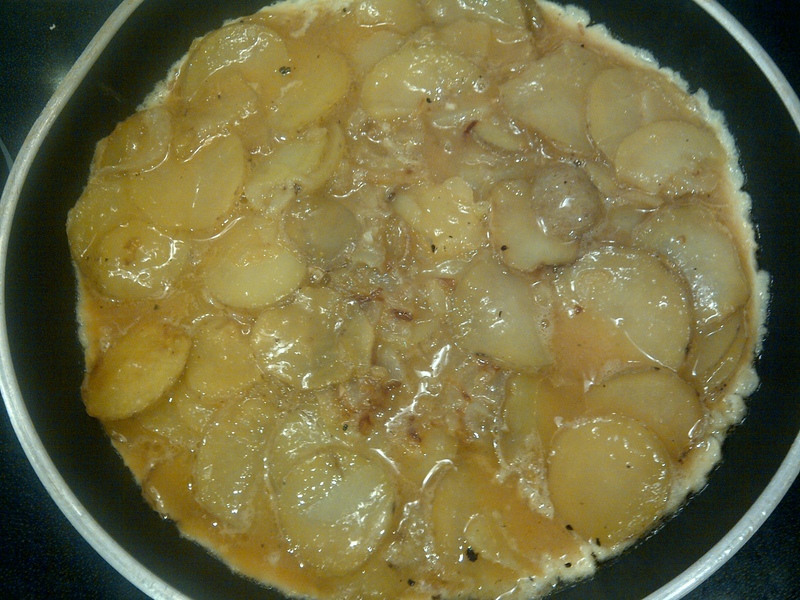 Put in the egg and potato mixture and distribute the potatoes evenly. Cook very gently until the tortilla is mostly set but still a bit runny in the middle. Heat your grill to medium hot. 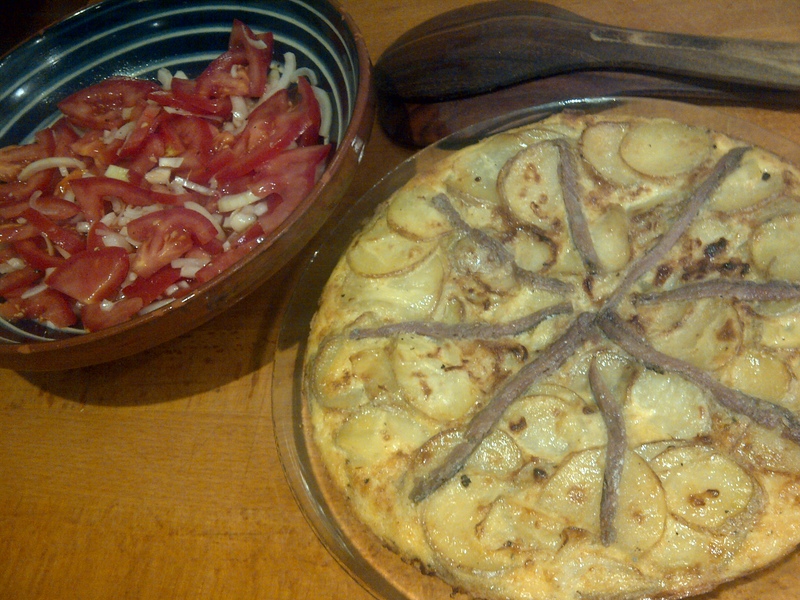 Arrange the anchovies, if using, in a spoke pattern on the top of the tortilla. Put the tortilla under the grill until the top is lightly browned but there’s still a bit of give in the middle when you press it with a finger. Remove the pan from the grill, place a plate over the top of the tortilla (one which fits inside the edges of the pan) and invert the tortilla onto the plate. Then take another plate and do the same again so that it’s the right way up. * You can finish the tortilla in the frying pan using this inversion method, if you want to, sliding it back into the pan upside down to finish cooking the top, now the bottom (are you still with me?). 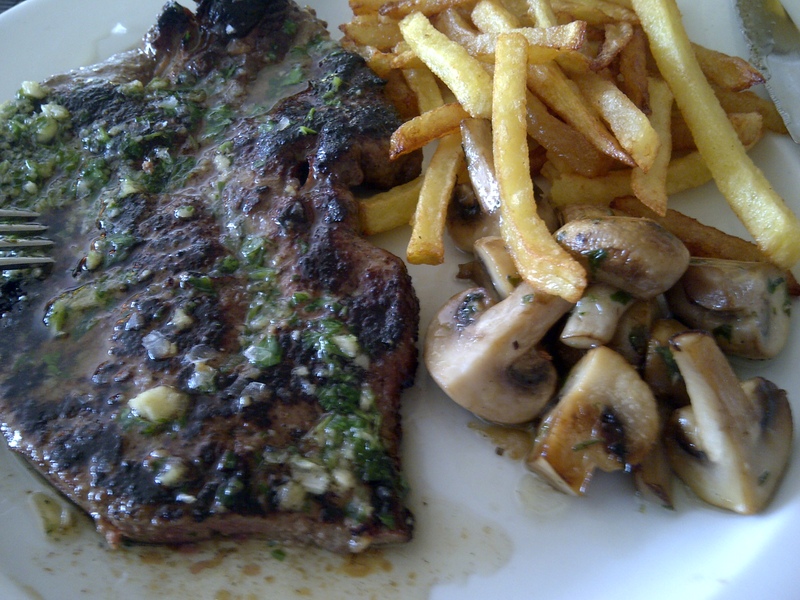 But I find grilling it is easier and less likely to dislodge the anchovies. Allow to cool for at least 20 minutes. I think it tastes best served tepid. You can put it into the fridge once it has cooled completely but take it out again half an hour before you want to serve it. Never serve it fridge-cold. This is lovely with a simple salad or as part of a mixed tapas meal. It makes great picnic food and if you really want to go for carbohydrate overload you can put a slice between two pieces of buttered baguette. At some point I’ll share more of the recipes Sarah learned while working for the Valencian Von Trapps: a delicious gazpacho and a classic Valencian paella. Meanwhile, if you want to know more about Catalan cooking, you can’t do better than Colman Andrews’ excellent book, Catalan Cuisine. This entry was posted in Cook books and blogs, Eggs and dairy, Mains, Producers, Restaurants and reviews, Vegetarian and tagged Aigua Blava, Begur, Catalan Cuisine, Celler de Can Roca, El Mirador, Girona, Mediterranean Food, Palafrugell, Placa de Madremanya, Spanish cooking, Spanish omelette, tortilla by Linda Duffin. Bookmark the permalink. But I must say it looks delish andmore elegant than the reverse the plate version. The honour is all mine! I’ve learned so much from you over the years. (Yeah, sorry about the “donkeys’ years” reference, by the way – journalistic accuracy, lol).